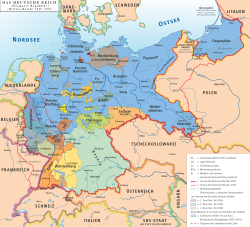 German states during the Weimar Republic period. The coat o airms shawn abuin is the version used efter 1928, which replaced that shawn in the "Banner an coat o airms" section. The Weimar Republic (German: Weimarer Republik [ˈvaɪmaʁɐ ʁepuˈbliːk] ( listen)) is an unoffeecial, historical designation for the German state as it exeestit atween 1919 an 1933. The name derives frae the ceety o Weimar, whaur its constitutional assemmly first teuk place. The offeecial name o the state remeened Deutsches Reich, unchynged syne 1871. A naitional assemmly wis convened in Weimar, whaur a new constitution for the Deutsches Reich wis written an adoptit on 11 August 1919. In its fowerteen years, the Weimar Republic faced numerous problems, includin hyperinflation, poleetical extremism (wi paramilitaries – baith left- an richt-weeng) as well as contentious relationships wi the veectors o the First Warld War. The fowk o Germany fautit the Weimar Republic raither nor thair wartime leaders for the kintra's defeat an for the humiliatin terms o the Treaty o Versailles. Weimar Germany fulfilled maist o the requirements o the Treaty o Versailles awtho it niver completely met its disairmament requirements an eventually peyed anly a smaw portion o the war reparations (bi twice restructurin its det throu the Dawes Plan an the Young Plan). Unner the Locarno Treaties, Germany acceptit the wastren mairches o the republic, but conteena'd tae dispute the eastren mairches. Frae 1930 onwart Preses Hindenburg uised emergency pouers tae back Chancellors Heinrich Brüning, Franz von Papen an General Kurt von Schleicher. The Great Depression, exacerbatit bu Brüning's policy o deflation, led tae a surge in unemployment. In 1933, Hindenburg appyntit Adolf Hitler as Chancellor wi the Nazi Pairty bein pairt o a coaleetion govrenment. The Nazis held twa oot o the remeening ten cabinet seats. Von Papen as Vice Chancellor wis intendit tae be the "éminence grise" that wad keep Hitler unner control, uisin his close personal connection tae Hindenburg. Within months, the Reichstag Fire Decree an the Enabling Act o 1933 haed brocht aboot a state o emergency: it wiped oot constitutional govrenance an ceevil leeberties. Hitler's seizur o pouer (Machtergreifung) wis permissive o govrenment bi decree withoot legislative pairteecipation. Thir events brocht the republic tae an end—as democracy collapsed, the foondin o a single-party state begoud the Nazi era. This page wis last eeditit on 5 Juin 2018, at 09:18.